Franz_Kafka is a Legacy Library. Legacy libraries are the personal libraries of famous readers, entered by LibraryThing members from the Legacy Libraries group. » Franz Kafka's legacy profile. Franz_Kafka is also an author. 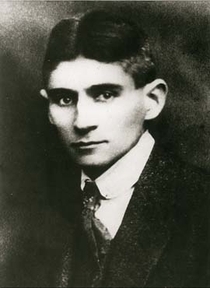 » See Franz Kafka's author page. About my libraryThe entries in this library derive from Jürgen Born's "Kafkas Bibliothek", a catalogue raisonné of books known to have been in Kafka's possession, as well as some he only may have had, but certainly knew about (is known to have ordered, bought, referenced or read). The Franz Kafka Society in Prague houses a "replica" of Kafka's private library on its premises: Společnost Franze Kafky.